It’s been a strange first half between Manchester United and Liverpool, with the main event so far being three players having to be subbed off injured. 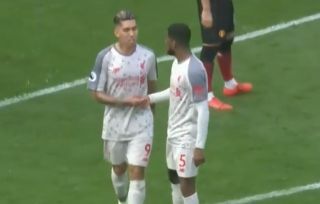 Roberto Firmino is the latest to have to be replaced, with the Brazil international hobbling off and Daniel Sturridge being brought on in his place at Old Trafford. This is a real worry for Liverpool as Firmino has so often been a key performer for them under Jurgen Klopp, while Sturridge is likely to be rusty after a lack of much first-team action this season. Firmino’s departure follows two subs for United as well, with the home side losing Ander Herrera and Juan Mata early on, with manager Ole Gunnar Solskjaer bringing on Andreas Pereira and Jesse Lingard for them, respectively. It remains to be seen how these changes will affect the flow of this game, but it’s far from ideal for either manager, who will have put a lot of work into picking their teams for this huge clash.